View More In Double Boilers - Page 3. Boiling Milk in a milk boiler is a safe and effective way to preserve valuable nutrients and flavor. The double boiler design slowly and gently warms up the milk to its boiling temperature. Eliminates excessive heat, which can result in scorched flavor and formation of protein layer. Whistle in the boiler gently intimates you that the boiling process has begun. Add water to the milk boiler by unscrewing the whistle. Fill the water in the boiler. Do not overfill the boiler, overfill will result in water spilling out of the whistle while boiling milk. Medium to High flame setting will also result in the water spillage..Screw in the whistle to the milk boiler. Keep the boiler on a stove and pour milk in it. Do not heat the boiler without any milk. Water is heated first and then the heat is transferred from the water to the milk. The double boiler design limits the overflow of milk. This ensures that the milk is heated slowly and thoroughly without the risk of burning. 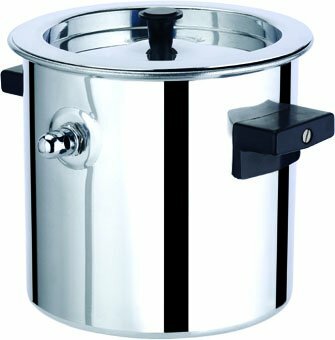 Boiler is made from high quality Aluminum and comes with Bakelite handles. This boiler is not dish washer safe. Discoloration of the inside vessel may happen depending on water hardness after 1st use.